Do you need blinds for your conservatory? Contact Pippas Blinds Ltd. We provide attractive conservatory blinds for properties across Northampton and the surrounding areas. To transform your conservatory into an attractive space, get stylish conservatory blinds installed by Pippas Blinds Ltd. Our products can turn your conservatory space into an impressive area. 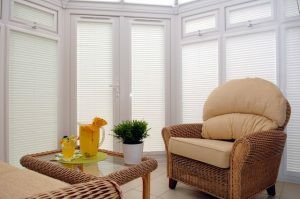 Our blinds can reduce the heat and glare during the summer and retain warmth during the winter. You can, therefore, use the space all year round. If you live in or around Northamptonshire, give us a call today. If you’re looking for high-quality conservatory blinds, contact Pippas Blinds Ltd. Our products are functional as well as beautiful. We can keep your space free from heat and light and protect your privacy at the same time. They also make your conservatory space beautiful and add value to your home.